I breed very selectively for my next show dogs. Not all dogs are destined for the show ring however, and these are the babies I offer for sale when I have them available. Keeping in mind that I breed for supreme health, conformation and temperament, all puppies, regardless of show and pet designation, are raised with the same care and love. I expose my puppies to the same conditions that they would experience in your home. They are used to vacuum cleaners, radios, televisions and rides in the car. To me it's very important to find for each puppy bred by me a permanent and loving home. When you buy a puppy from me, your puppy will come with the Kennel Club registration certificate which will be endorsed, "Not to breed from". Nota Bene: Puppies sold abroad or puppies with show potential sold to show kennels in the UK will not have an endorsement on them, as they have the knowledge of the breed and will put the work in to breed a healthy litter. Your puppy will be vet checked, and come with proper health records, vaccinated and dewormed. At date of sale each puppy is at least 9-10 weeks old before they go to there new homes. You will be provided with advice/care leaflet and how to take care of your puppy in the best way. After a puppy is placed in his new home, I am here 24/7 to help you and welcome questions with friendly support. I do not believe that it is possible to predict the outcome of a puppy future in the show ring at the age of 9 weeks. Therefore at the age of 9 weeks I do not sell show puppies but puppies with show potential and family pets. I expect that any dog can be returned to me at any time in it's life, regardless of the reason. I am strict that you never would turn your dog into rescue or to a shelter if your circumstances warranted your dog's surrender. I expose my puppies to the same conditions that they would experience in your home. They are used to vacuum cleaners, radios and televisions. They are handled constantly from birth, unlike dogs who are raised en masse for pure profit. 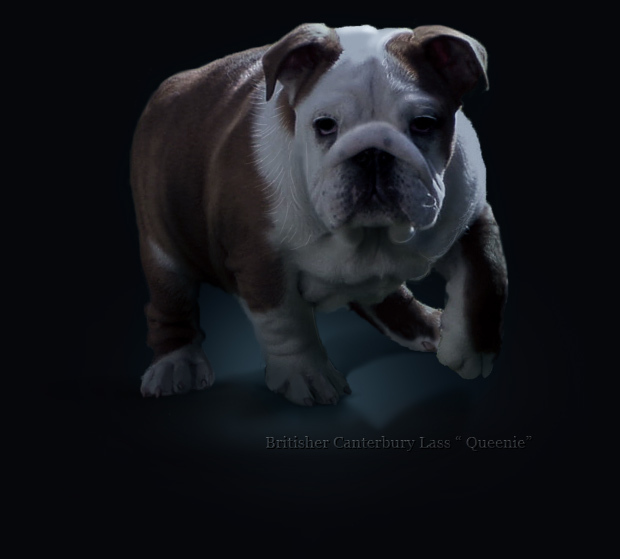 The increased popularity of Bulldogs has introduced a fair amount of fraudulent breeders and poor quality breeders. If you are looking for a discount, please look somewhere else. While you might find a bulldog for a cheaper price, chances are that you will more than make up for it in veterinary fees later on. I. A non-refundable deposit of £ 1000 (Pound Sterling) will be the confirmation of the reservation/purchase, upon which the puppy will be reserved for you. II. The puppy will not leave my home until he/she is fully paid for. III. I do ship my puppies. The shipping cost is extra and will be paid by the new owner. Please read my Puppy Waiting list information before you contact me.